This language proved to be problematic for Slep-Tone in Slep-Tone Entertainment Corp. v. Coyne. Slep-Tone’s use of its trademark was through a licensee, not by Slep-Tone directly. * The rub is that the Code of Federal Regulations says “(b) If the mark is not in fact being used by the applicant but is being used by one or more related companies whose use inures to the benefit of the applicant under section 5 of the Act, such facts must be indicated in the application.” And what’s missing from the fill-in-the-blank form and declaration language quoted above? Anything about use of the mark through a licensee. As an initial matter, it is not clear that an applicant’s failure to disclose that a mark was used by a related company, standing alone, would constitute fraud on the USPTO. “Fraud in procuring a trademark registration … occurs when an applicant knowingly makes false, material representations of fact in connection with his application.” “To constitute ‘fraud’ the knowing misrepresentation to the PTO must be ‘material’ in the sense that but for the misrepresentation, the federal registration either would not or should not have issued…. And had Slep–Tone expressly stated in its application that it was relying on the related-company doctrine, the registration still would have issued. Accordingly, Slep–Tone’s alleged omission might not have been material in the first place. The signatory believes that: if the applicant is filing the application under 15 U.S.C. Section 1051(a), the applicant is the owner of the trademark/service mark sought to be registered; the applicant or the applicant’s related company or licensee is using the mark in commerce on or in connection with the goods/services in the application, and such use by the applicant’s related company or licensee inures to the benefit of the applicant; … and/or if the applicant filed an application under 15 U.S.C. Section 1051(b), Section 1126(d), and/or Section 1126(e), the applicant is entitled to use the mark in commerce; the applicant has a bona fide intention to use or use through the applicant’s related company or licensee the mark in commerce on or in connection with the goods/services in the application. * The fact that Slep-Tone claimed its only use was by a licensee puzzles me. Slep-Tone manufactures karaoke accompaniment tracks and sells them to karaoke jockeys (“KJs”) who are hired by bars and restaurants to provide karaoke entertainment. The main thrust of the many lawsuits Slep-Tone has filed is a claim that the KJs are making illicit copies of the tracks. But for trademark purposes (as distinguished from copyright purposes), the KJ is the purchaser of the original goods, not a licensee. A license would authorize the KJ to make new goods using the mark, but that’s not the relationship here. So as I see it, Slep-Tone is fighting a battle it never needed to fight. 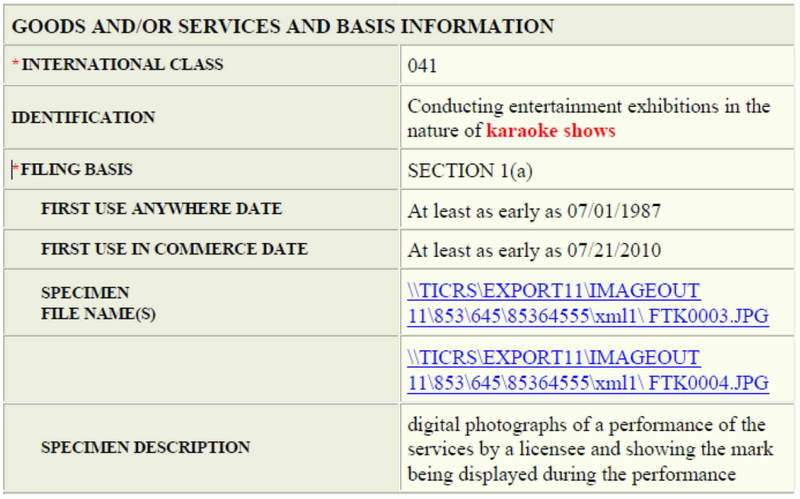 Attempting to answer the question you left in the footnote: The two registrations that Slep-Tone owns are for the Sound Choice mark in connection with a service, in particular “conducting entertainment exhibitions in the nature of karaoke shows.” It seems to be the case that only karaoke DJs and not Slep-Tone were the ones providing that service. So although Slep-Tone was using the mark in connection with goods (CDs), it could not rely on that particular use for the registration applications. Disclaimer: I am a patent lawyer who only dabbles in trademarks.